Those are great names! And your pigs are adorable! 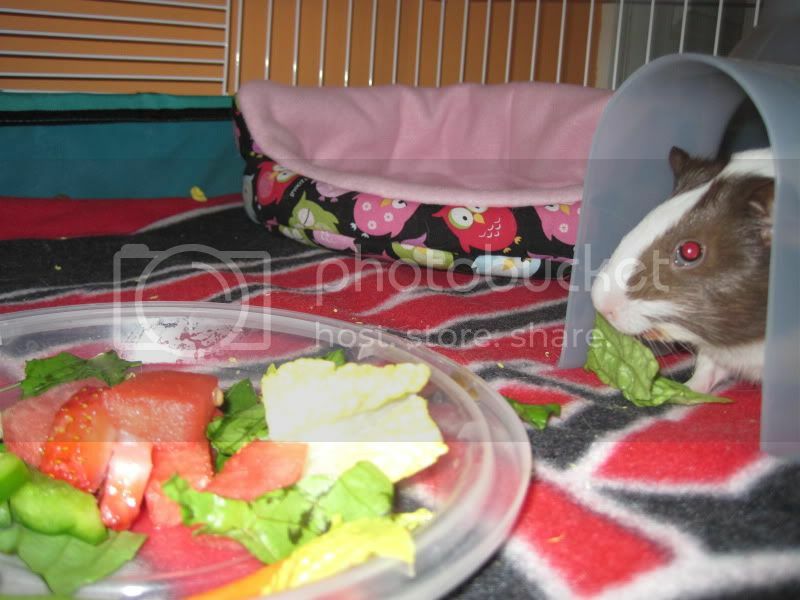 I especially love the photo of the pig under the cuddle cup! Do you have somewhere for them to hide in in the cage? We use little kiddy stools, cardboard boxes and towels pegged to the corner of the cage. It's important that they have somewhere to hide when they get scared. Yes, they have a pigloo which is pretty much where they stay. That or under the cuddle cup instead of sleeping in it! Took pictures of breakfast this morning! Penny is clearly the model, I have to use the flash on Sundae to get a good picture of her. But she's still adorable! My pug is loving them. If I leave him out of the room when I'm in there he will cry until I let him in. They are so precious! I would concentrate more on more leafy greens and cut back on the fruit. I used to give carrots too often and now I have cut way back. They can have a baby carrot about every other day (some say everyday is ok). I usually tend to not give fruit on the days my boys get a carrot. 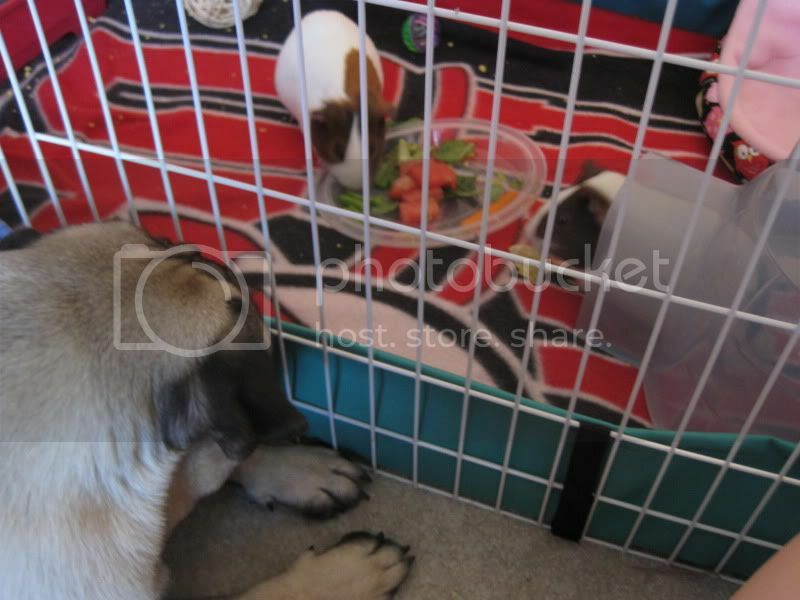 That's very cute, pigs and wrinkley pug head. Their plate looks exactly like the Chinese food lid I used to use for my pigs. Alright I'll remember that cNp. 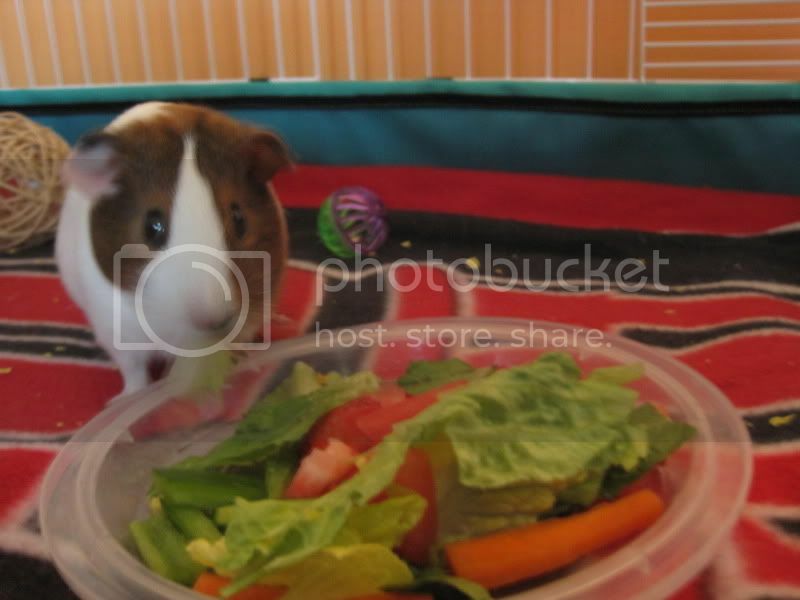 The different websites that I look at about guinea pig diets seem to say something different every time and it's a bit confusing. Tuggell that is a Chinese food lid! KM hay came today and my piggies can't get enough. Their other hay I was throwing out because I thought it was in there too long but this one I've already had to refill twice since I got it this afternoon. They keep running around popcorning and then going back and eating it again, then rinse and repeat haha. Right now I have a separated little kitchen area for them with the bottom of a hamster cage and put carefresh bedding in it. For the most part they have only been going to the bathroom in there and I've had to clean it out pretty much every day and carefresh is not inexpensive. So I was thinking about buying a corner litterbox but I didn't know what I should put in it that won't cost me a fortune, suggestions? Aspen wood shavings in bulk has been the best choice for price and availability. If in a pet supply store be sure to ask if they have the bulk or bale size quantities, they usually put the tiny tiny bags out on display for the tiny petstore cage size litter box for $6.99 - $9.99 and the larger bales in back. I've done the litterbox kitchen thing and I used Carefresh for a while (you can get it cheaper online), but now I'm back to using Aspen shavings. While I miss the carefresh of course, the aspen shavings do the same job!